umbilical cord | WomanPlace , Inc.
Clamping and cutting of the umbilical cord should be delayed for three minutes after birth, particularly for pre-term infants, suggests a senior doctor, Dr. Andrew Weeks, in the British Medical Journal. 28/08/2007. Early clamping and cutting of the umbilical cord is widely practiced as part of the management of labor, but recent studies suggest that it may be harmful to the baby. Dr Andrew Weeks, a senior lecturer in obstetrics at the University of Liverpool, looked at the evidence behind cord clamping. For the mother, trials show that early cord clamping has no ill effects, he writes. But what about the baby? At birth, he says, the umbilical cord sends oxygen-rich blood to the lungs until breathing establishes. 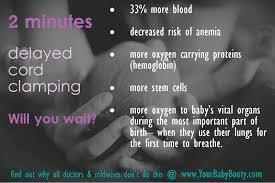 When a baby is born it must transfer from receiving oxygen from the placenta to receiving oxygen from its lungs. For this to happen, the baby’s lungs must first expand, and the burst of blood from the umbilical cord helps to get the newborn’s lungs to expand properly. So as long as the cord is unclamped, the average transfusion to the newborn is equivalent to 21 percent of the neonate’s final blood volume and three quarters of the transfusion occurs in the first minute after birth. For babies born at term, the main effect of this large autotransfusion is to increase their iron status. This may be lifesaving in areas where anemia is endemic. In the developed world, however, there have been concerns that it could increase the risk of abnormally high levels of red blood cells and bile pigments in the bloodstream often leading to jaundice. But trials has shown this is not the case. Umbilical cord blood is a baby’s life blood until its birth. It contains stem cells, red blood cells, and more recently scientists have discovered that umbilical cord blood contains cancer-fighting T-cells. For pre-term babies the beneficial effects of delayed clamping is greater, he says. Delayed clamping is consistently associated with reductions in anemia, bleeding in the brain, and the need for transfusion. He proposes that in normal births, delaying cord clamping for three minutes with the baby on the mother’s abdomen should not be too difficult. The situation is a little more complex for babies born by caesarean section or for those who need support soon after birth. Nevertheless, it is these babies who may benefit most from a delay in cord clamping. For them, a policy of ‘wait a minute’ would be pragmatic, he says. “Clamping the umbilical cord immediately (within the first 10 to 15 seconds after delivery) prevents the newborn from receiving adequate blood volume and consequently sufficient iron stores. • In a BMJ editorial, James Neilson, professor of obstetrics and gynecology, states that delayed clamping should be practiced. This entry was posted on March 7, 2011, in baby, baby doctor, Child birth, childbirth, delayed umbilical cord clamping, newborn, nurse midwife, OB/GYN, Pregnancy, Research Study and tagged delayed cord clamping; anemia; blood loss, umbilical cord.